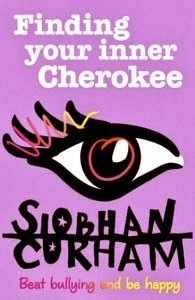 Finding Your Inner Cherokee by Siobhan Curham is a wonderful (free!) non-fiction e-book that addresses the subject of bullying. It is written by the author of Finding Cherokee Brown which was published by Electric Monkey earlier in the year and is the story of a girl who is dealing with bullying at school. Though related to the same issues that are addressed in Finding Cherokee Brown, you do not need to have reading it to enjoy Finding Your Inner Cherokee. Finding Your Inner Cherokee is a short guide filled with stories about other people's experiences with bullying as well as advice and activities that are there to help, support and empower victims of bullying. As a child and teenager, I was bullied. So Finding Your Inner Cherokee (and also Finding Cherokee Brown) were very emotional reads for me. While I didn't carry out all of the exercises included in the book all of the activities and advice really made me stop and think more about how bullying did affect my happiness, my confidence and my life. Finding Your Inner Cherokee is a very helpful, hopeful and inspiring book. I wish that I'd read it as a teenager and even though it has been many years since my own personal experiences with bullying, the message that this e-book contains are still messages that I find important to be reminded of! A huge thank you to Siobhan Curham for providing me with a free review copy of this book prior to its publication. Finding Your Inner Cherokee is being published for free during Anti-Bullying Week, please visit here for more information. And stay here on the blog and read a guest post by Siobhan Curham about Finding Your Inner Cherokee!